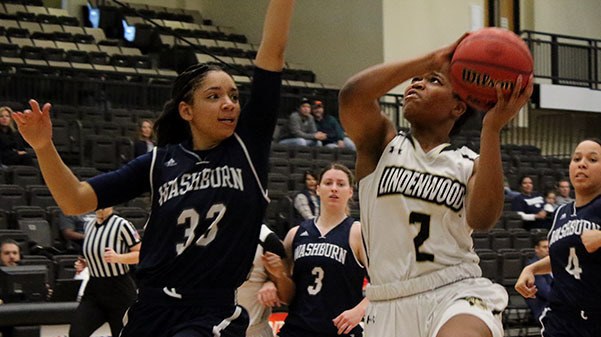 In a file photo from 2017, Lindenwood's Charisse Willams tries to get a layup past Washburn's Denesia Smith at the Hyland Arena in St. Charles. Photo by Walker Van Wey. The Lions suffered a 20-point loss to Emporia State Thursday night. The Hornets set the tone early, outscoring the Lions 28-17 in the first quarter. The second quarter was closer than the first, but the Lions were unable to make a dent in the lead. The Hornets ended the first half leading 48-32. Senior Tyra Jones and graduate student Emily Miller led the way for the Hornets, scoring 13 points each. Junior Jessica Wayne followed closely behind with 12 points. Miller and Wayne grabbed 4 rebounds each, while Jones grabbed 6. For the Lions, it was junior Kallie Bildner leading the charge with 15 points and 8 rebounds. Senior Lexie Moe added 8 points and 7 rebounds. Only three other Lions were able to put points on the board in the half. In the second half, it was much of the same for the Lions. They were outscored 22-16 in the third quarter. The only quarter the Hornets did not outscore the Lions was the fourth, where the Lions only outscored them by two. The Lions fell by a score of 83-63. Bildner and Moe each finished with double-doubles. Moe finished with 21 points, a career-high, 11 rebounds, and was on fire from three-point range hitting five out of six from downtown. Bildner finished with 21 points and 12 rebounds. For the Hornets, Wayne finished the win with 23 points and 7 rebounds, Miller finished with 20 points and 5 rebounds, and Jones finished with 17 points and 6 rebounds. Lindenwood had the slight edge in bench points, outscoring the Hornets’ bench by a score of 13-11. The Hornets controlled all other facets of the game. They outscored the Lions 16-11 in second-chance points, 36-20 in points in the paint, and held the biggest advantage in points off turnovers, leading 30-4. The loss is only the fourth of the season for the Lions and brings their record to 13-4 overall and 7-3 in MIAA conference play.